Clearing out the engine bay. So, back on with breaking down the RF84. The next logical job was to tackle was the radiator/petrol tank central core, and removal of the oil system. The first surprise was that the oil system wasn’t completely empty. So when I removed the oil filter everything near by got covered in oil. Beyond that removing the, tank, filter and its associated piping was pretty simple. Clear up simple, but extensive. The design of the RF84 echo’s that of the Swift of the time. 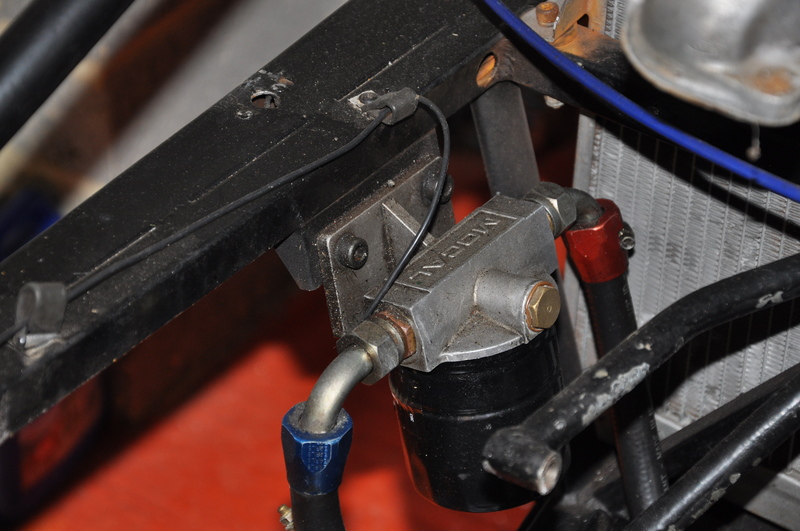 The radiator is positioned behind the driver and petrol tank, with air being ducted from the side of the car. This efficient approach, I guess, would pay dividends somewhere like Silverstone or Brand’s GP, where the car would run at high speeds for a large part of the lap. This aero advantage will be slight, or non-existent, in a hillclimber. After the ally ducting had been removed there was then the puzzle of removing the rad and tank. The tank was retained by a large rubber strap which had perished, essentially killing any compliance. As I cut it I was imagining a series of calls in which I was told each time that they were no longer possible to obtain. I also got thinking about a fuel cell – a tank the size the RF84 has certainly isn’t needed when a weekend’s total mileage doesn’t exceed 5 or 6. Price and packaging constraints – the original tank is shaped to optimise the airflow to the radiator – may put an end to those thoughts. After the oil episode it shouldn’t have come as any surprise that the cooling system was still full of coolant. At least the ensuing flood helped to clear up the remains of the oil. 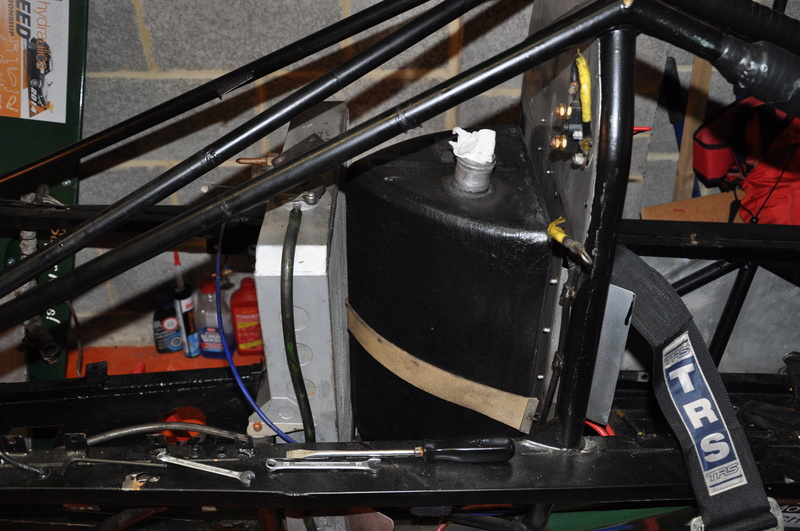 With the retaining strap gone getting the two major components out of the space frame initially proved tricky. Basically the key to the puzzle was removing the fuel line (which involved a torch and long screwdriver to remove the jubilee clip), as when that was free, the tank could be removed, followed by the rad. I’ve also finalised the list of mods for the Panda for next season. This is topped by the seat and harness which have already been purchased, and includes a new exhaust, oil temp sensor and gauge, new steering wheel, and almost certainly a Columbo and Bariani cam. Absolutely great day at Curborough yesterday with the HSA. A lot of lessons learned and a PB for me. 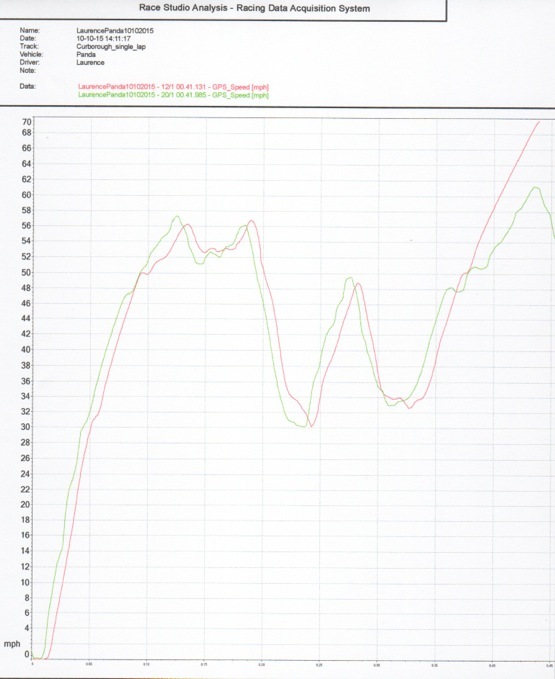 But as the graph shows later, much more to come. 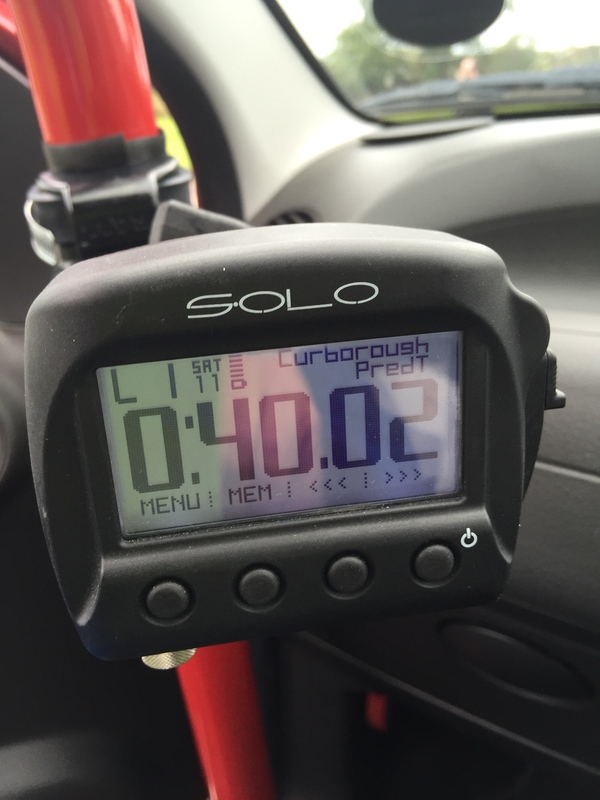 (Excuses warning… ) I’d been practicing on Wednesday and put in some fast laps – The data logger had a 40.02 recorded. You do however have to add 1 to 1.5 seconds to anything that the logger tells you (not sure why to be honest.) So we could have that down as a 41.5. Thinking about that session I did the runs in groups of 3 and all the fast times were on run 2 or 3. Must be either the tyres or driver being warmed up, and indicates that something might need doing about both. So a 42.16 in practice on Saturday made me think that a 41 something was a realistic proposition in the event. 42.3 in the first run seemed OK and I really went for it in run 2. This was a real flyer until I missed the last gear change so badly that I needed to go back into second rather than keeping it in 3rd. The time was 42.6 even with that huge mistake. The data shows the fouled up change brilliantly – 42.6 seconds and 62 mph across the line – that just would have been a 41 something… At least I managed to outperform quite a few people in other classes. Oh well – lets see where we get next year!! So that was my first season in sprints and hill climbs. Amazing, just amazing – and the HSA has been a really great club and championship to do it with. 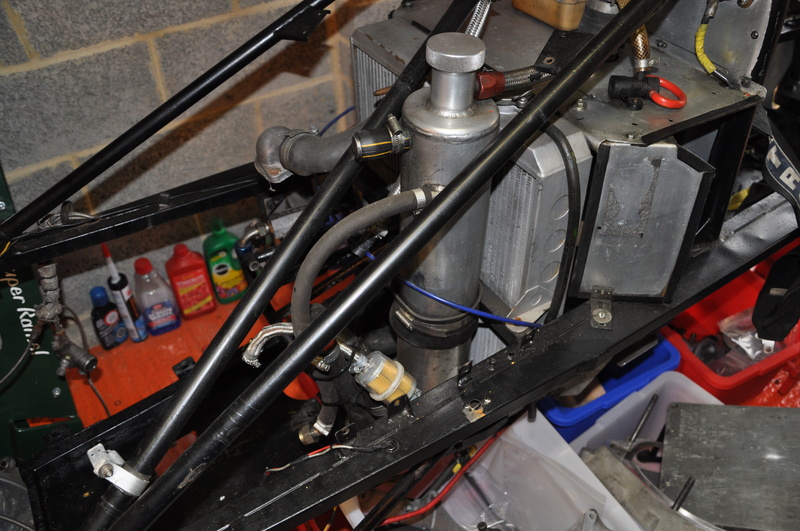 Now to crack on with the RF84 and plan the mods to the Panda for next season. The first refurbished item comes back..
Today the first of the refurbished parts was delivered. 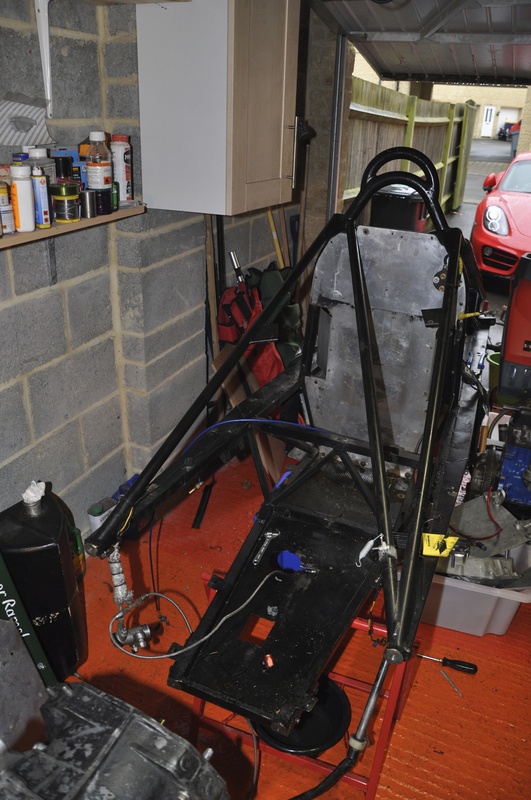 Things are crossing over – the car is still being stripped down and bits are coming back. 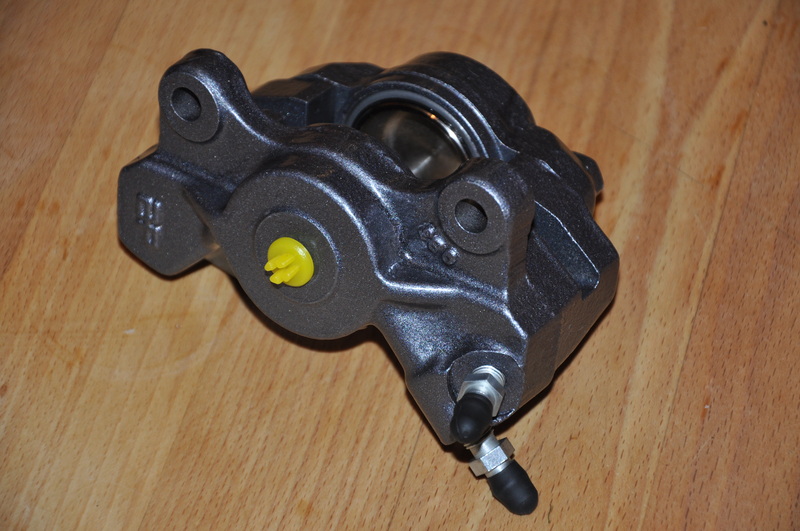 The callipers have been to Brake Calliper Specialists and have come back looking superb and with all new seals and pistons. Possibly better than new – which is the target for the whole car. 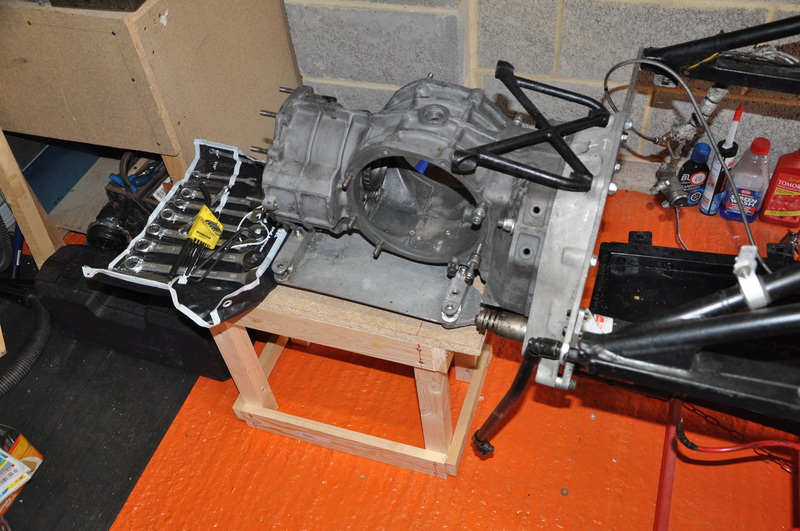 Removing the gearbox casing involved making a wooden structure to support it as it was unbolted. It took most of Sunday. This was very useful in the strip down process, but will be essential in the rebuild process as the Mk9 Hewland isn’t, in modern terms, a lightweight item. Now the gearbox unit has been removed the next step is stripping out the radiator, oil tank and fuel tank at the rear, then the steering rack and steering column. The next items to go off for refurbishment will be the wheels, hopefully clearing some space in the garage. 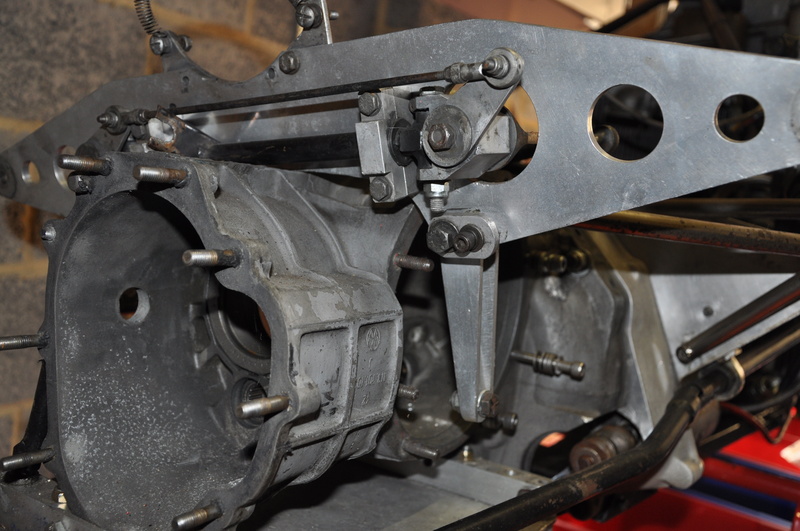 Something which is causing confusion is the rear anti-roll bar mechanism. I can see how it works, but I’m really not sure how it adjusts.. I’d be grateful if anyone has any pictures of another one.